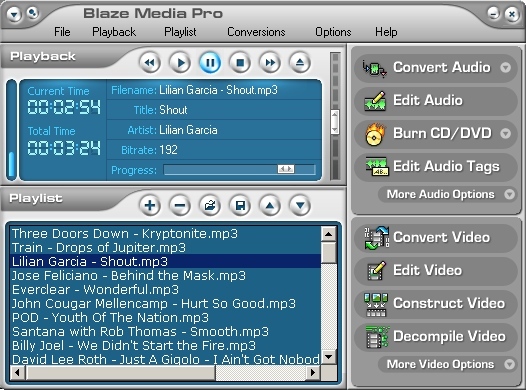 Blaze Media Pro is powerful music software, providing the capability of a music converter, music editor, music burner, music ripper, and music player all in one software application. The software offers many advanced, yet easy to use, features for converting between MP3, WAV, WMA, OGG, and more music formats. Sample audio conversions include MP3 to WAV, WAV to MP3, WMA to MP3, MP3 to WMA, OGG to MP3, MP3 to OGG, and many more! Blaze Media Pro features an audio editor that can easy edit music files in virtually any format and bitrate, save to different bitrates, etc. The audio editor also supports recording music from any available source, such as streaming music online, cassettes or LPs via line-in, etc. Music recordings can, of course, be saved into any supported format in seconds. The software's Burn Audio CD feature allows for quick and easy burning of music files to CD-R or CD-RW media in record time. Music ripping is also available via the software's CD Tracks conversion feature. It can quickly rip tracks from CD, obtain track and disc information from the online CDDB, automatically name the saved music files using the CDDB information, and automatically insert music ID3 tags from the same information. A music lyrics search feature is provided that allows users to quickly and easily find the lyrics for a song searching by its title or the artist. Of course, a music player is also included which supports all of the same music formats, playlists, and many options for functionality control. Blaze Media Pro offers all of this in one highly configurable application. Advanced options are available for maximum control, although they are completely optional, making Blaze Media Pro the perfect choice for music software for users of any experience level. Click here for more information on Blaze Media Pro and its music software features or download your copy now.